The survey data in Under Developed was pretty bleak, and the overarching recommendation was less than precise—specifically, that nonprofit leaders need to develop and maintain a “culture of philanthropy” that will permeate the entire organization. In other words, they could no longer simply pin their hopes on a single development executive or even a development team to save the day or them. Nonprofit leaders need to develop and maintain a “culture of philanthropy” that will permeate the entire organization. It’s a culture in which fund development is a valued and mission-aligned component of everything the organization does. Everyone—the board, executive director, and staff—has a part to play in raising resources for the organization. It’s about relationships, not just money. It’s as much about keeping donors as acquiring new ones. Nonprofit leaders who frequently commiserate among themselves can easily fall into a kind of group-think. Continually focusing on our common problems can become a quick path to accepting their inevitability. Eventually, a rebel emerges from the crowd who just dares to do things differently. Their radical idea occasionally works. Typically, that puts everyone else in the room in an awkward position—to either follow his or her lead or criticize the ideas so as to justify the status quo. This process of change dynamic (some call “creative disruption”) has been reoccurring since the invention of the first wheel. That was precisely the situation in a meeting for university presidents that wound up launching my career as a fundraiser. See CASE FOR ENDOWMENTS. Sometimes leaders need to think outside the box, or think outside their industry. Occasionally, they’ll learn from some unlikely sources. I don’t remember exactly how it happened, but early on in my fundraising career somebody signed me up to attend a three-day conference in New Jersey on customer relations for Maytag employees. The more I listened to trainers, the more I realized there are a lot of similarities between customer relations and donor relations, between creating corporate culture and creating a nonprofit culture. Zappos, the online shoe company, is today’s industry leader in terms of customer service. Over and against all conventional wisdom, Zappos has leveraged its outrageous commitment to customer service and company culture to become a $1 billion business. Below are a few facts about Zappos that can be applied to nonprofits. Hint: Every time you see the word “customer service,” substitute the word “donor relations.” When Tony Hsieh, CEO of Zappos, talks about developing and maintaining company culture, think about doing the same with organizational culture—that is, developing a culture of philanthropy based on the four characteristics Cynthia Gibson outlined in the Beyond Fundraising paper. Zappos call-center standards intentionally violate every traditional sales tactic known to business. There are no scripts, no closing tactics, and no call-time performance metrics to track the number calls processed per hour. Zappos reps are known for doing whatever it takes, not only to satisfy but to build genuine relationships with customers. Occasionally, that leads to helping customers with problems that have nothing to do with shoes. Currently, the record customer-service call is a whopping ten hours! While many websites make it as difficult as possible to talk with an actual person, Zappos’s phone number is on every web page and representatives are available 24/7. Call-center reps are required to be familiar with competitors’ website so they can easily refer customers in the event that Zappos is out of stock or doesn’t carry a particular shoe. Zappos reps encourage customers to order and try on many shoes and keep only the ones they like. They have a 365-day return policy and periodically surprise customers with random shipping upgrades. There are many stories of the crazy extremes Zappos reps go to serve their customers. Nonetheless, customer service (donor relations) is not the company’s highest priority. It’s creating and maintaining organization culture. Early on Zappos leaders created a list of ten core values. What makes the Zappos approach unique is their willingness to hire or not hire potential employees based their company culture. Potential hires go through two sets of interviews—one to measure job skills and the second to determine culture fit. For instance, one of the Zappos core values is humility. Human Resources recruiters ask their shuttle drivers to rate potential employees on how they were treated. If candidates are smug, dismissive, or displaying an air of self-importance, those candidates are automatically eliminated from consideration, regardless of their other skills. Subsequent performance reviews place a 50/50 emphasis on performance and culture fit. 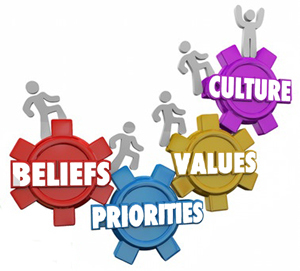 There’s a five-week training course on Zappos culture and core values. Every new Zappos employee, whether they were hired as accountants, lawyers, or technicians, spend the last two weeks of training in the call center talking to customers (donors) and being trained on the finer points of Zappos customer service (donor relations) ethic. In order to insure they are hiring people who fit the Zappos culture, at the end of the five-week training, new hires are offered a cash reward to quit. In the beginning, it was a $200 offer and only about 2% took the offer. Over the years, the reward to quit has grown to over $4,000. Still less than 5% take the offer. Tony Hsieh says, “Our number one priority is company culture. Our belief is that if you get the culture right, most of the other stuff, like generating sales (donations), delivering great customer service (donor relations), building a long-term enduring brand (repeat donors), will just happen naturally on its own.” That’s basically the same thing the two Haas Fund reports are saying: To be successful in the future, nonprofit leaders need to develop a culture of philanthropy within their organizations. In an article I posted a few years ago, entitled Six Blind Men and the Organizational Elephant, I illustrated how staff and stakeholders interact with an organization (i.e. touch the elephant) in different ways. Consequently, each staff or board member, donor or beneficiary of services, has a unique experience and a unique way of describing the organization—a different story to tell. Development directors, the head storytellers, need to move beyond their own storytelling to enabling others in the organization to talk about their own experiences. This also has a human resources application—that is, hiring or recruiting people at all levels who will buy into a culture of philanthropy. Taking new or potential employees or board members along on donor visits or creating their own opportunities to tell the organization story will reveal a lot about their attitude toward fundraising—if they can or will embrace a culture of philanthropy. Some people think of the development department like a crazy aunt in the attic. Nobody wants her to come out because the family is a bit embarrassed about the things she says and does. In the same way, people in the organization above, below, and on every side of the development staff (in some organizations, board members and the president included) are a bit embarrassed about the need to raise money. Some people (maybe some of your people) secretly abhor the idea so much that they are unlikely to ever change. Consequently, the organization assigns “the dirty work” of fundraising to the development staff—definitely not the cultural characteristic you’re trying to develop. Some people think of the development department like a crazy aunt in the attic. LEADERSHIP ACTION ITEM: Of course, developing a culture of philanthropy that permeates the entire organization has to begin at the top with board members and the CEO. Beyond that, leaders will need to be very intentional about recruiting new board members and hiring new staff at all levels who are excited about the organization mission and willing to boldly tell its story. 2. In organizations with a culture of philanthropy, fund development is a valued and mission-aligned component of the overall work, rather than a stand-alone function. Board members and CEOs understand that nothing related to the organizational mission happens without funding. Yet, the mission of fund development is rarely a part of the organizational mission statement. LEADERSHIP ACTION ITEM: I’m not necessarily suggesting that leaders have to change the mission statement of the organization. If, however, developing a culture of philanthropy is the goal, leaders will have to aggressively deal with a silo mentality (relegating fund development a department). Sometimes this can be as simple as regularly communicating with all staff and stakeholders about fundraising goals, challenges, and accomplishments. “Valued and mission-aligned component” is also a reference to the esteemed importance of fund development in relationship to all other functions of the organization. I know of a particular nonprofit that’s struggling right now. The CEO has cut the development budget and at the same time simply informed the development director on the amount of money the she needed to raise for a specific project. What this is really about is the inclusion of development staff involved at all levels—strategic planning, budgeting, and goals for annual fund, major gifts, and planned gifts. LEADERSHIP ACTION ITEM: The board and the CEO should always consider the senior development office as an essential part of the executive team. Dictating fundraising goals to senior development executives who are not included in the planning process is a sure-fire moral killer. Dictating fundraising goals to senior development executives who are not included in the planning process is a sure-fire moral killer. In Beyond Fundraising, Cynthia Gibson writes about treating every donor the same regardless of how much they give. On the surface, that sounds impractical. When, however, you look at donor cultivation from a long-term perspective, the category-D donors are the future category-A donors. Most nonprofits visit the donors in category A and B but rarely make it to the Cs and Ds. Yet, cultivating relationships among your C and D donors is one key metric of high performance nonprofits. See Fundraising for Your First Quarter. LEADERSHIP ACTION ITEM: In many organizations, this will require some significant changes in organizational priorities and staffing. I’ve seen far too many examples of development executives responsible for more major donors than they can ever relate to on any level. Overall fundraising has been down over the last five years. There are several reasons for this, but that’s another story. Many nonprofits have responded with policies aimed at making their organizations as efficient as possible. I’m all for efficiency except when it is achieved by cutting into their efforts to cultivate donor relationships. It’s more efficient in the short run for farmers to eat their seed rather than plant it. In the near future, however, it will cost them dearly. From a fund-development standpoint, efforts to save money on donor retention wind up costing far more on new-donor acquisition. LEADERSHIP ACTION ITEM: Creating a culture of philanthropy will require courage, a different focus, and investment. Investing in donor relationships and donor retention is a highly cost-effective fund development strategy. If you do it well enough, you accomplish two objectives with the same investment—donor retention (repeat customers) and donor acquisition (new customers). As Peter Drucker once said, “Culture eats strategy for breakfast.” I’ve known a lot of development professionals for a lot of years. My belief is that development professionals don’t quite the profession because they no longer want to make a difference. And many don’t accept other development jobs only for a higher salary. They often quit because of the organizational leadership and/or the organizational culture in which they are serving. Consequently, developing and maintaining a culture of philanthropy as defined by Cynthia Gibson in Beyond Fundraising, helps to solve many problems at once. The more cross-department communication that promotes understanding of a culture of philanthropy, the more buy-in you’ll have. If you have a cross-disciplinary team that consists of staff from marketing, fundraising, and other departments, think about how you can best design those meetings so they are not simply reporting but nurturing a culture of philanthropy.